Notes: An original production by Sunrise. An American live action adaptation was announced in 2004 but later dropped from production. People fear what they don't understand. For centuries, odd occurances, tragic accidents, and unexplained deaths have often been attributed to individuals with unusual powers. Some societies call them ESPers, psychics, wu-jen ... witches. The truth is that witches actually do exist. Some people have what it takes to be a witch and don't even know about the power within them. A semi-secret international organization, STN, has been tracking, cataloguing and, in the event of rogues who would use their powers to hurt others, hunting witches. Armed with vials of a strange liquid called "Orudo" that negate a witch's power, the agents of the STN-Japan team investigate crimes and other strange happenings linked to these individuals. Their newest member, arriving to replace an agent killed in the line of duty, is Sena Robin. She's a witch herself, but uses her powers of pyrokinesis (fire manipulation) to help the STN track down others like her, but with less noble intentions. However, when Robin becomes the hunted, rather than the hunter, will she be able to rely on her new friends or will she just end up being another STN statistic? What is the STN doing with all the witches that they capture? How is "Orudo" connected to the STN-J's latest cases? 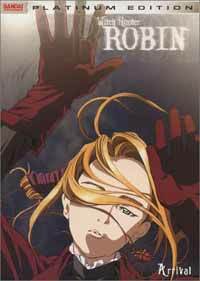 Fellow reviewer, Christi, said: "Witch Hunter Robin is almost like something Chris Carter would do if he directed an anime series." This is actually not far from the truth. The atmosphere, characters, and setting of this series would fit almost perfectly into any season of The X-Files or Millennium, with a supernatural, spooky undercurrent that fans of the occult or unexplained will definately enjoy. The ambience this shows gives off could almost be described as "neo-goth". The STN-J's headquarters is an old-fashioned multi-level office building complete with iron-gated elevator lift, carved gargoyles, and a porter to answer the front door. The character designs are distinctly lacking the large eyes, crazy outfits or wild hairstyles (Robin's unusual pigtails excepted) seen in other shows. Everyone dresses in subdued colors (mainly black), but somehow witch hunters wearing any other color would seem out of place in a show like this that strives to be as "realistic" as possible. The characters are a mixed bunch ranging from the "I'm too cool to have more than three lines a show" Amon, to the slacker girl intern, Doujima, to the team hacker, Michael. All of the main cast have distinct and fully rendered personalities, some more interesting that others, but all very well done. The interaction between the characters is fun, as you can clearly see the little social cliques, friendships, and animosities that exist within the STN. Sometimes the characterization falls into common cliches (Amon's ice-man attitude and the office chief's penchant for yelling at everyone), but the story moves along fast enough that these small lapses in the otherwise solid performances given can be forgiven. The animation is well done, with good frame rate during the action scenes and some nicely integrated effects when the various witches use their powers. The artwork is also better than average with highly detailed backdrops and wonderfully original character designs. The dark color palette used in most of the episodes might turn off viewers who prefer more colorful settings, but lends itself to the mood of the show very well. The music is likewise subdued, but the opening theme is very well done, and overall the soundtrack carries the atmosphere of the show perfectly. The plot moves along at a brisk pace and takes a sharp turn towards the middle of the series, but more action oriented fans may find the show a bit dull. The level of action present is about what you would expect from a detective show, or maybe one of the faster paced episodes of The X-Files. Fans who enjoy mysteries and the supernatural will love this series, those who enjoy comedy, action or romance will probably be indifferent. Still, this show has enough to offer that even those not hooked in by its premise might still find something to enjoy. Recommended Audience: There is a lot of violence, but none of it is extremely graphic. Witches get shot with Orudo bullets, a few people get fried or beaten up. No real fan service, but the dark mood of the show is probably better suited to teens and up, rather than the little ones. There is some Christian (Catholic) iconography that religious folks may not take kindly to.